It's howling a gale up on the top deck. 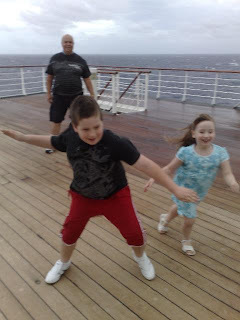 Harrison and Lilly woke up really early, so Dad took them up on deck while Liz and I slept in. They thought it was great that the wind was almost blowing them over. morning, which is supposed to work wonders. convince her to get the injection too. Dad and I almost won a "name that tune" competition in the Piano Bar last night. More photos and news soon! Next Next post: Do I look bald in this?